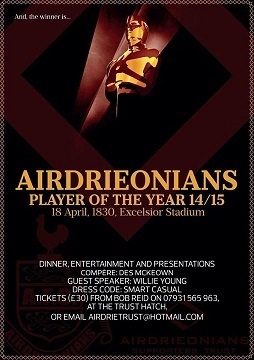 Airdrie Supporters Trust have announced the details of this seasons (2014 -2015) Player of the year event. So the question is who you you think deserves it? Voting forms will be available at home matches shortly. Put names in a hat for this and draw one out!. Naw it would have to be Fraser for me , best player most weeks by far. Always enjoy POTY night, especially if it has been a good season or morale is high like last year. I would much rather it was after the last home game of the season though and the guest speaker was somebody we haven't had before. Willie Young is a good speaker and I have nothing against him but I have heard him 3 times now including the POTY a couple of years ago and it is like he has a well rehearsed script that he uses all the time. JB vetoed the last home game due to the uncertainty over when the play offs will take place. THe previous week we are at Peterhead, which knocks that on the head, so the Ayr game was the next available date. Not sure about Willie Young as choice....may be the timescales involved. Only got the go ahead at the start of this week. Should be a good night. Paddy Boyle gets my vote for for POTY, although Fraser and Lister run him close. I thought Fraser at first but paddy boyle reminds me of Paul Lovering gives his all every game would have to be Paddy for me.